No personal preferences are available for inventory tracking and control, but QuickBooks 2012 provides several Company Preferences features regarding inventory and items. 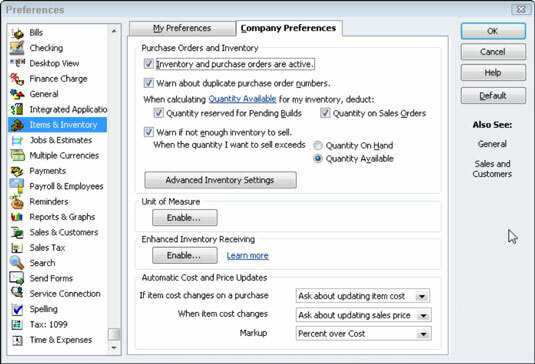 You can turn the QuickBooks inventory and purchase order features on and off. You can specify you want to be warned if you enter a purchase order number you’ve previously used. And you can specify how QuickBooks determines whether you have or don’t have enough inventory to sell. If you buy or sell an item using more than one unit of measure — say you sell fabric both by the yard and by the bolt (the rolled-up fabric) — QuickBooks lets you quantify your inventory items using more than a single unit of measure. If you’re interested in doing this, click the Unit of Measure Enable button. If your business operation processes multiple inventory receipts for a single vendor bill, multiple vendor bills for a single item receipt, or prepayments for inventory, you may want to consider enabling QuickBooks’ enhanced inventory receiving (EIR) feature. By turning on this feature, you can probably improve your inventory item counts and avoid the sorts of item count and QuickBooks errors that often occur in these more complicated inventory situations. You cannot, however, turn off enhanced inventory receiving after you turn it on. Accordingly, research the details of the QuickBooks enhanced inventory reporting feature (by clicking the Learn More hyperlink) or consult your accountant before you click the Enhanced Inventory Reporting Enable button. To have QuickBooks automatically update the item list’s purchase cost, sales price, and markup percentages, select the appropriate action from the Automatic Cost and Price Updates list boxes.